I wrote my first novel for adults when I was fifteen. It was not very good, of course, but I knew I’d discovered what I wanted to do. Twenty years and ten or twelve novels later, I sold a book. It happened to be a young adult novel. One thing led to another in the juvenile/teen world. With the exception of a nonfiction book for adults, all of my published books have been written for young readers. Until now. 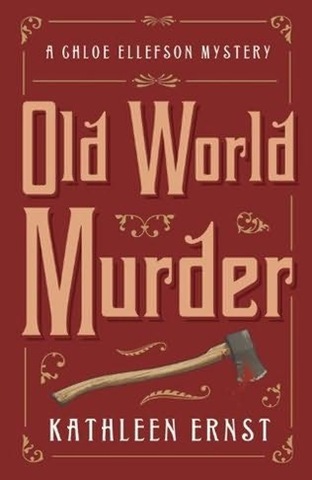 Old World Murder: A Chloe Ellefson Mystery will officially be released on October 1. Advance-order copies are already finding their way into readers’ hands. I love writing for children and teens, and don’t plan to give it up. Still, it’s awfully nice to sit down at the grownup table, thirty-five years after writing that first manuscript! I had a blast writing Old World Murder, am hard at work on book 2 in the series, and have ideas for more bouncing around in my head. I am enormously grateful to all the readers who make it possible for me to do what I love. I’ve got a blog tour set up for the month of October. Sure, I hope to spread a little buzz about the book. But I’ll also be giving a book away at each stop—winner’s choice of Old World Murder or something from my backlist. It’s a small way of saying thank you to some of the wonderful people who love mysteries, and take the time to keep in touch online. I hope you’ll drop in. You might get lucky! 10/4 – Recipe For Promotion – Are You Missing An Ingredient? 10/11 – Start Your Mystery With A Bang! 10/19 – Have You Got What It Takes To Write A Mystery? Should It Stay, Or Go? 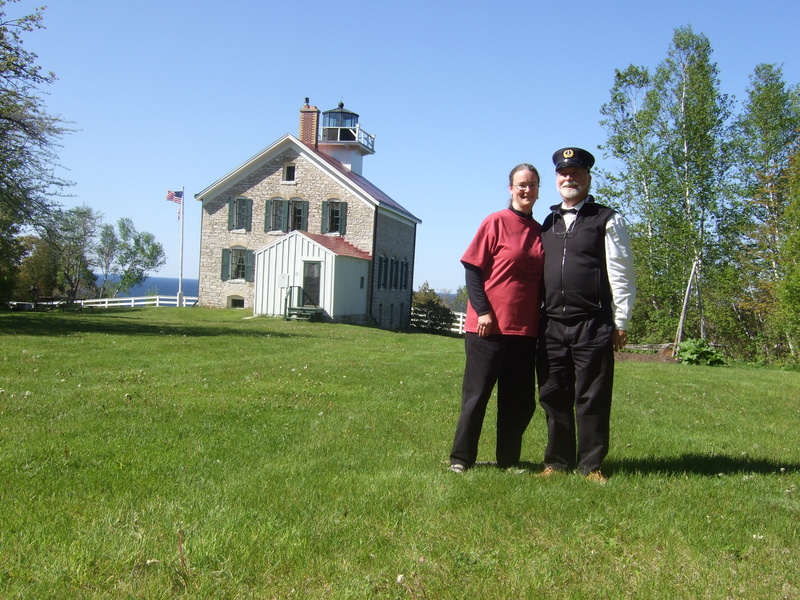 Scott and I recently spent nine wonderful days as live-in docents at Pottawatomie Lighthouse. It sits on a cliff within Rock Island State Park, off the tip of Door County, Wisconsin. It was our second stint, and we hope to go back. We love the whole experience. Pottawatomie is the oldest light station in Wisconsin. It was established in 1836, twelve years before Wisconsin became a state. The first keeper lived in a tiny stone cottage, and tended a separate light tower. In Pottawatomie’s earliest days the light was fueled with whale oil. In 1858, the lighthouse service built a new tower and attached duplex, designed to house a keeper and assistant keeper and their families. When whale oil became too expensive, the keepers used lard to light the lamp. Pig fat was cheaply available from the Chicago stockyards. It was also a difficult fuel to use. Pots were likely kept simmering on the stove, and several times during cold nights keepers would haul hot lard up to the lantern room. Every morning a sheen of fat had to be cleaned from the glass Fresnel lens. The 1858 lighthouse (the back addition, a summer kitchen, was added later). 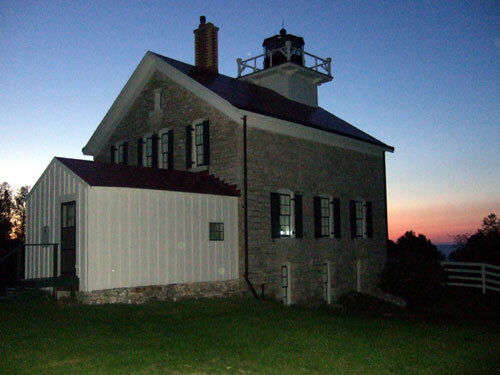 The lighthouse has been beautifully restored to represent it’s 1910 appearance by the Friends of Rock Island, a support group which works with the Department of Natural Resources to preserve, maintain, and interpret the site. By 1910, the light was fueled by kerosene. For a time huge quantities were kept in the lighthouse cellar. The keepers finally were successful in their request for a separate oil house, but all that oil still had to be hauled up steps from the beach below, or up from a landing over a mile away. Keepers lived in the lighthouse until it was automated in 1946. Forty years later, the Coast Guard planted a metal tower beside the lighthouse, with a solar-powered light on top. Last year, a visiting Guard member told us that maintaining the light took about four hours a year. He also told us that when these automated lights die, they won’t be replaced; ship captains will rely solely on GPS and computerized navigation. During our 9-day visit this year, in fact, the modern light was not functioning. Perhaps we’ve already seen the end of the era of warning lights on Rock Island. View from the parlor window. The modern tower sits in close proximity to the 1858 lighthouse. By almost any standard, the metal tower is an eyesore. It certainly detracts from the lovely restoration work done on the 1858 building with such great care and expense. 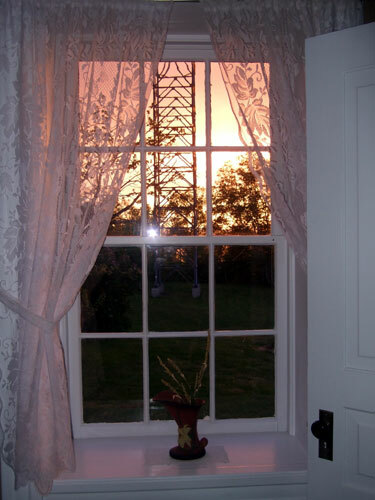 The Friends of Rock Island have worked hard to create an impression of 1910 both inside and outside of the lighthouse. Most people who love Pottawatomie Lighthouse can’t wait for the day the tower is formally decommissioned and removed. But while on Rock Island this year, I heard an alternative perspective proposed. 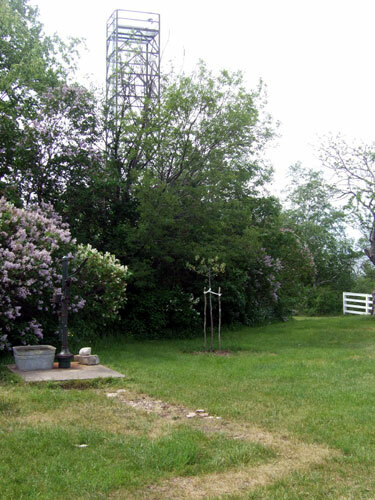 Now, visitors to the station can stand in one spot and see the foundation lines of the 1836 stone cottage, the 1858 lighthouse, and the 1986 tower. The entire history of Rock Island’s guiding lights can be taken in at a glance. Here's the 1836 foundation line, with modern tower in background. The lighthouse is just out of view on right. All that remains of that first station is the tiny stone privy. 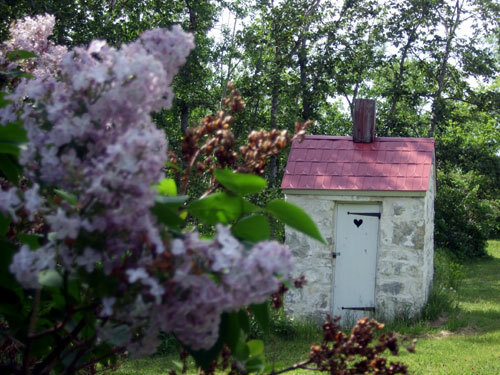 Today it is celebrated as the oldest building in Door County. The first keeper's stone cottage was so poorly made that it soon needed to be replaced. This outhouse is all that remains. 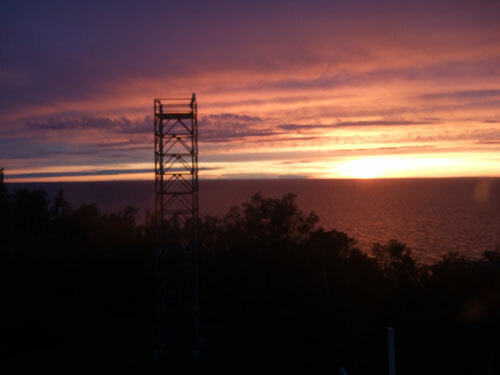 So…should that metal tower and solar-powered light be part of the interpretive story? A century from now, will interpreters wish it had been saved? When any restoration project is undertaken, philosophical choices have to be made. There is no right or wrong answer. Me, I want to see the tower removed. I want to be able to stand in that peaceful clearing, and contemplate the families who lived in the lighthouse, without any modern intrusion. Docents can use photographs of the tower to discuss change over time. But I also acknowledge that the tower is part of the continuum, and part of Pottawatomie’s story. What do you think? Should the metal tower stay, or should it go? 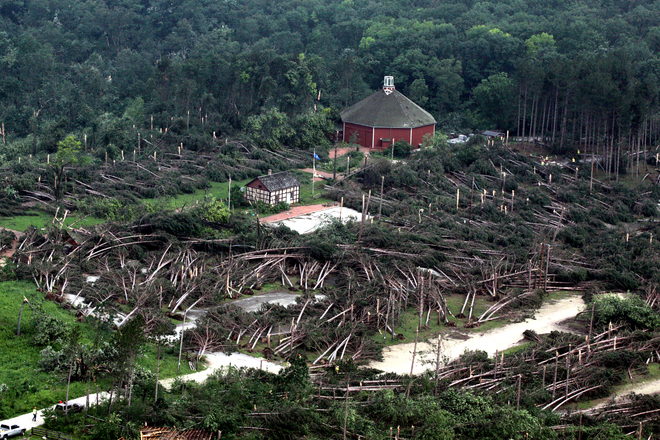 Old World Wisconsin was hit by an F2 tornado on June 21. First, the good news: it happened at night, when the site was closed. No one was hurt. None of the farm animals were hurt. The damage to the historic structures is, miraculously, minimal. Now the bad news: almost three thousand trees were destroyed. The photos and aerial footage I’ve seen leave me heartsick. The photo above shows the parking lot and visitor center area. Many of the downed trees were pines, planted decades ago. The pine plantation was not the native oak-prairie landscape. Still, I loved those trees. They shaded the parking lot, and the visitor center mall and picnic area. More than that, though, they helped visitors transition from the modern world to the site itself. 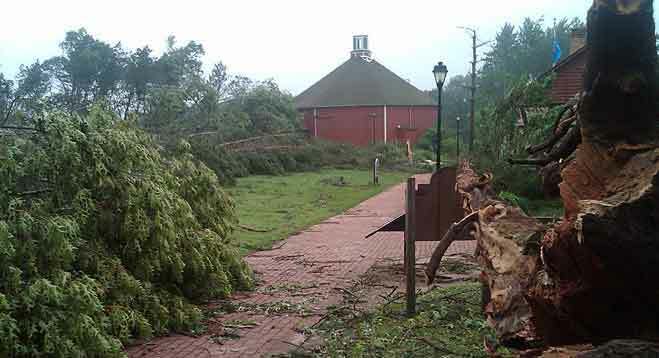 Before the tornado, visitors turned from Highway 67 onto an entrance drive that wound through the pines. The trees helped create a reflective environment. When visitors headed out onto the site, the pines provided a living screen between the historic site and modern intrusions. One of the first buildings visitors encounter on site is the Caldwell Farmers’ Club hall. It is still standing, but an animal shed beside it was destroyed. Not all the losses were planted pines, though. Many magnificent old oak trees, remnants of oak savannah prairie, graced the area. I suspect that most of those are also gone. One of my Old World friends wrote, “The pictures just don’t show the real damage. You stand on the Caldwell hill and you honestly don’t know where you are – it is just wrong, all wrong.” Another friend, who has worked at Old World for decades, says the area looks like a war zone. It’s an apt analogy. I am reminded of civilian accounts I read while researching Too Afraid To Cry. After the Battle of Antietam, local farmers got lost in their own neighborhood, because all landmarks were gone. Way back when, I majored in forestry at West Virginia University, with a focus on environmental education. When I worked at Old World, researching and helping to create new interpretive programs, I always tried to think about 19th-century people within the context of their environment. Whenever I write, I try to instill a strong sense of place into the narrative. One of the things I’ve always loved about Old World is the landscape itself. The original site planners did a superb job. It’s possible to look out the window of an old house and see a garden, an agricultural field, a prairie remnant, and woods beyond. Old World Wisconsin is, for the time being, closed. The most urgent work is well underway—making the parking lot and all historic structures accessible. In the weeks and months to come, I’m sure the Old World staff will create a long-range plan for restoring the landscape. In the on-site prairie areas, that likely means replanting the oaks. I don’t know what will be decided for the entrance area. What I do know is that this place which is so dear to me will never, in my lifetime, look the same. 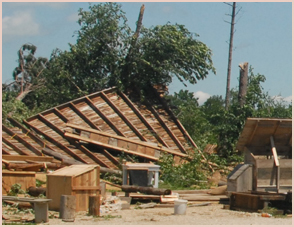 The Old World Wisconsin Foundation has started a Tornado Relief Fund. For more info: http://www.friendsoww.org/. In 1982, I went to work for an historic site called Old World Wisconsin. 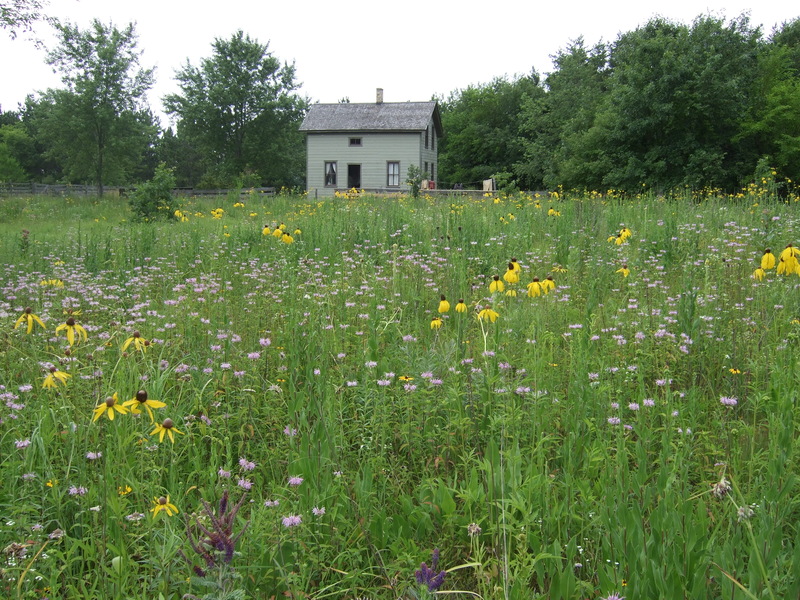 It is an amazingly wonderful site–over fifty historic structures moved to a sprawling tract within the Kettle Moraine State Forest, in southeastern Wisconsin. I was hired as Second Lead interpreter in the German area, which at that time consisted of three fully restored farms. Later I moved behind the scenes, and ultimately served as Curator of Interpretation and Collections. 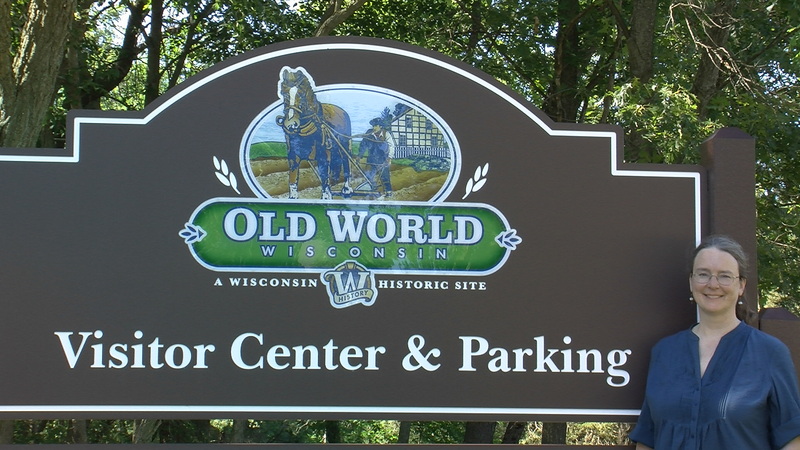 I worked at Old World Wisconsin for twelve years. During those years I developed my writing skills, as well. What better training could someone writing historical fiction ask for? After I left Old World, I often relied upon memories as I wrote historical novels. Did one of my characters need to warp a loom, harvest heirloom cucumbers, bake in a brick oven? Check. Did I need to describe the feel of flax fibers, the shadows in a room lit by an oil lamp, the taste of currant kuchen, the rattle of a threshing machine? Check. Over the past decade, I’ve written eight historical mysteries for young readers. A few years ago, I decided to write an adult mystery set at Old World Wisconsin. My fictional protagonist, Chloe Ellefson, is Curator of Collections. The year is 1982. Old World Wisconsin came back to life in my mind as I wrote the book. I started visiting the site again, and remembering how much I loved working there. The book took a long time to finish because I was under contract for other projects, and had to work around those deadlines. But I did finish it. And I’ve been offered a contract for it. So now, I’m looking forward to returning to Old World Wisconsin–in print. I’ve also been thinking a lot about historic sites in general. The stories they tell. The stories they inspire. Hence the blog. I hope you’ll visit often!